(a). It is at this level that all the objectives and major policies are laid down. (b). Instructions are given for preparing the necessary budgets for various departments, schedules and policies. (c). Preparation of premeditated plans and policies are done at this level. (d). Appointment of executives at central level or departmental heads. (e). Since it consists of Board of Director the top administration is accountable towards the shareholders for performance of the organization. (f). Harmonization and control are the two major roles played by the top management. (g). It guides the organization in the right direction towards achieving the goals and objectives. (a). The main role lies in the implementation of policies and plans as per the directives of the top management. (b). Preparing plans for the sub units of their respective departments. (c). Actively contribute in guidance and employment of supervisory level of management. (d). Their duty is to understand and elucidate the policies of the top management to the lower management. (e). Bringing together the activities within the department is another role at this level of management. (f). Assessment of performance of junior managers. (g). Timely and important reports or data to be sent to the top management. (h). 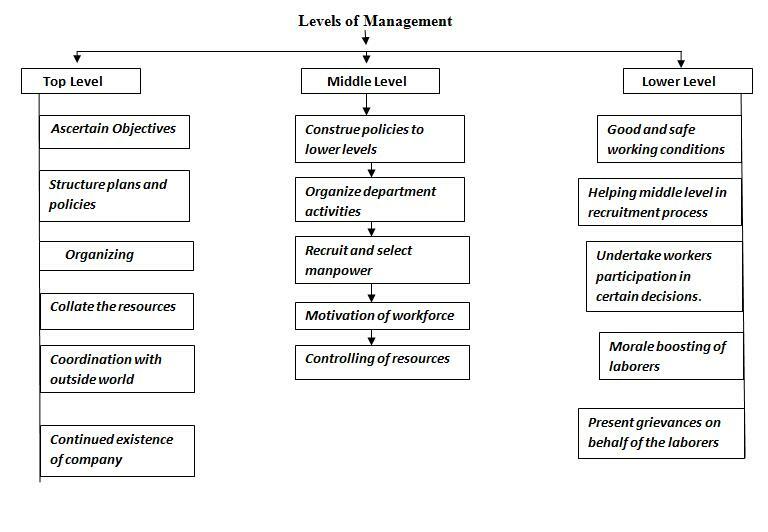 Motivation of supervisory managers is a vital role of this level of management. (a). Handing over jobs or responsibilities to a variety of workers. (b). Guidance towards day to day activities of the organization. (c). These managers are directly responsible for quality and amount of production. (d). They act as mediators in communicating the problems of workers and also undertake recommending solutions to higher level of organization. (e). They take stock of the machines and material required for the work to be done. (f). They are the role models for the workers as they are directly and constantly in touch them. (g). It is their duty to uphold discipline and decorum in the organization.